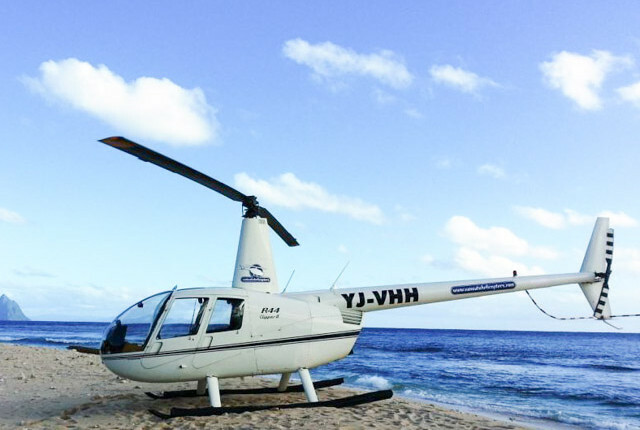 Your scenic flight takes you along the coastline, over the lagoons and reefs of Mele Bay. 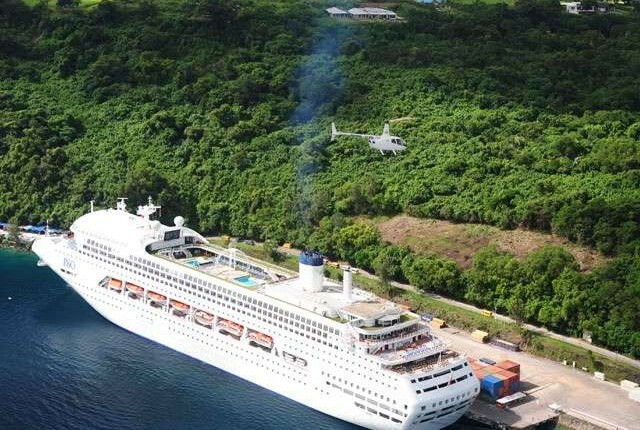 You will enjoy a bird’s eye view of the resorts and houses along Dream Cove and Paradise Cove. 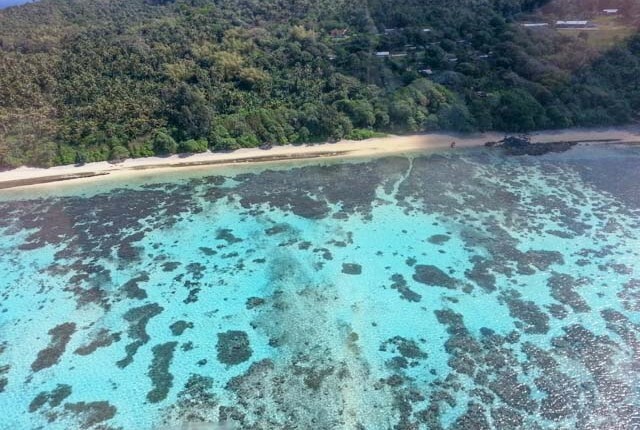 Then you will see the colours of the reef as you fly over local dive sites and cross the bay to Devil’s Point. Following the coastline we will take you past the famous Cascade waterfall and over Mele, Vanuatu’s largest Village. We head back to our floating pontoon via Hideaway Island Resort and marine sanctuary. 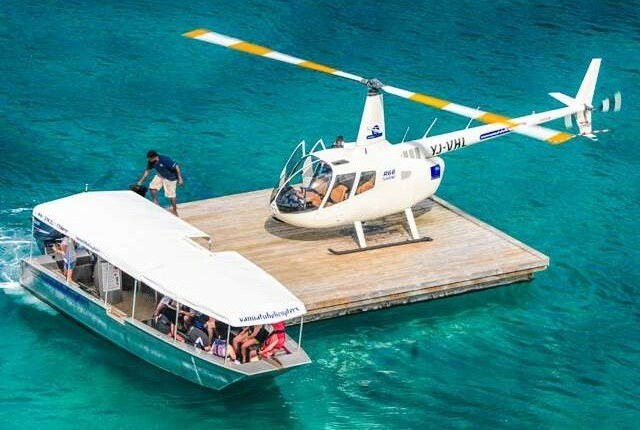 The flight lasts approximately 12 minutes and starts and finishes right on the seafront from our floating pontoon. 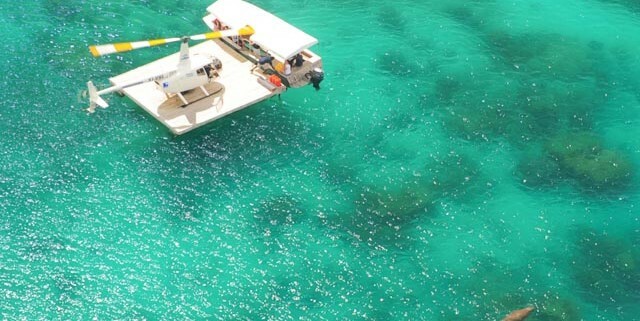 Our glass-bottom boat will transfer you from the shore to the pontoon. Each passenger has a headset for communication and your pilot will give you a commentary throughout the flight. Camera – you will have some wonderful opportunities to get great shots! All our flights have a minimum of 2 passengers and a maximum of 3. If you have a group of 4 or more please emails us. Flight times and routes may vary due to weather. Vanuatu helicopters fly 2 helicopters: A R44 Clipper II, and a Robinson R66. All pilots are from New Zealand and hold new Zealand Helicopter pilot licenses. The helicopters have a seat restriction of 130kg per seat. There are no special dress requirements, but everyone must were shirts and shoes. For children under 4 years old we provide a lap belt that goes around whoever is carrying the child. Children under 4 years old fly free (provided that there are 2 full fee paying passengers on the flight). Located next to the Nambawan Cafe on the Seawall, Port Vila. 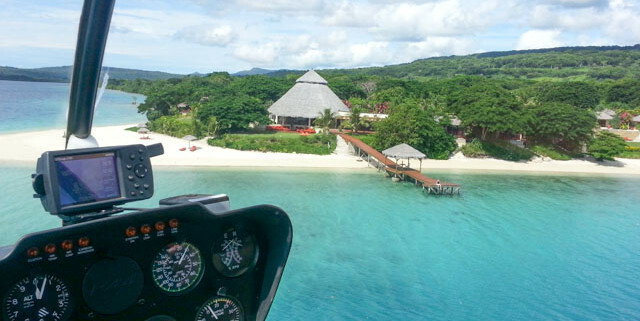 Vanuatu Helicopters depart from the Cafe, so just make your way down there and Check-In at the Helicopter Counter.